I'm pleased to introduce my new series; TERRITORY. 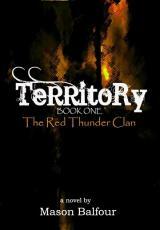 Book One: The Red Thunder Clan is currently available as an eBook for $2.99 and a print book for $9.99 at TERRITORYBOOKS.COM. Brief synopsis: The rogue vampire factions of North America have come under the scrutiny of the 13th Coven, the ruling class of vampire society; a rapidly failing leadership quickly losing control over their kind. They have begun to seek new lands dangerously close to the borders of three werewolf clans of the three breeds. Leading the endeavor is a fallen Red Marshal of the 13th Coven with her own agenda that could ignite a war. She is pursued by the werewolves of The Red Thunder Clan as well as a pack of Pure-Bloods; vampires sworn to hunt and destroy their own kind. Allied with an army of diseased and exiled vampires known as Shadow-Walkers, the fallen Red Marshal Sophia will stop at nothing in her quest to wage war against The Red Thunder Clan and any who stand against her; werewolf and vampire alike. Mason Balfour lives in the Midwest with his wife and their two boys, and several little furry things; their dog Molly and a motley crew of cats affectionately known as "The Rat Bastards". In addition to being a writer Mason is also a professional sculptor, painter and model maker. He enjoys books, movies, the art of special effects, folklore, mythology, crypto zoology, the unexplained and history as well as hiking and the outdoors. Mason has been writing for over fifteen years and has published one novel so far, which he is rewritting and plans to republish following 'Territory'. Following the publication of the first book he got sidetracked for a decade or so with his modest but rewarding career in free-lance sculpting and design. "I hope fans really love 'Territory'" he says. "It has something for every fan of the werewolf/vampire genres. There are a lot of aspects of these genres I wanted to reshape a bit, but I'm being very careful to address the things fans have come to expect and deserve from a story of this kind. I've never been as excited or dedicated to a writing project as I am with 'Territory'. I love this story, these characters. I'm four books into it and I don't know how far it will go. I have at least two more stories in my head with regard to this storyline. I have a few ideas for smaller, stand-alone stories within the world of 'Territory'. Where ever 'Territory' takes me, I only know that it's very far from over. I hope you will all take the ride with me".